The Mirage titanium framelock gentleman’s folder combines tasteful elegance in a sleek, lightweight package. Weighing a mere 2 ounces, the knife virtually disappears when clipped in either your pants or shirt pocket. When open, a delicate set of thumb serrations on the back of the blade is perfectly placed for grip security. The back line of the handle frame flows downward slightly to expose the serrations on the blade, while the blade becomes the extension of this visual line toward the point of the knife. 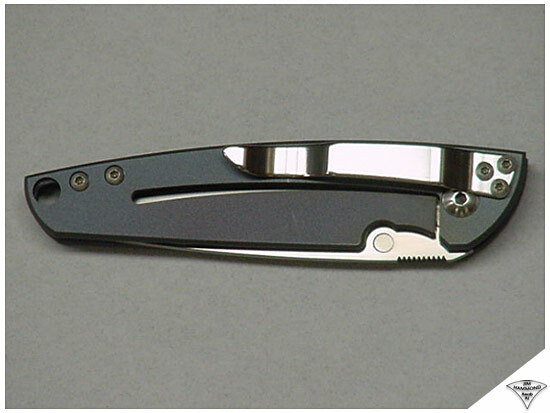 The knife has an open-frame construction with threaded shafts providing support. The perimeter of the titanium frames is radiused for maximum comfort. The thumbstud has a cupped head with a knurled collar for easy capture by the thumb. The clip profile follows the contours of the back of the handle and the teardrop shaped spring arm cutout slot on the reverse side. For customers opting to order a Mirage without the clip, an exquisite leather pouch is available as an option. icro-glass bead-blast finish, and the flats along the blade perimeter have a hand-rubbed satin. The titanium frames have a soft bluish-purple satin finish, which add to its refined appearance. 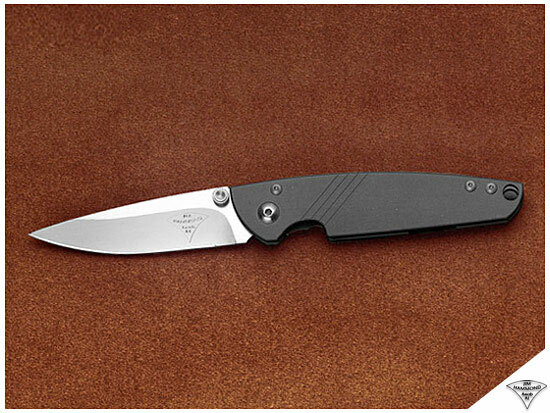 The Mirage framelock folder is the smallest Hammond Knives folder, and fills the bill as an elegant gentleman’s folder with a modern day style.